Susrutha performed surgeries on nose, ears, bladder, cataract, fistula, joints, haemorrhage more than 2600 ago with surgical instruments, but first known surgery performed on human body was mentioned in Rig-Veda (composed around 23720 BC), where a Prosthetic leg was attached to a queen’s leg, so that she could walk normal and even participate in war. Later, plastic surgery was performed in India around 6th century BCE by Susrutha and then popularized in the Arab world that actually launched it to Europe. Susrutha performed first rhinoplasty (nose-job) with a unique understanding of the circulation system. Cataract surgery was also known to the Susruta) in 6th century BCE. He did it with a special tool called the Jabamukhi Salaka, a curved needle used to loosen the lens and push the cataract out of the field of vision. The eye would later be soaked with warm butter and then bandaged. Though this method was successful, Susruta cautioned that cataract surgery should only be performed when absolutely necessary. Greek philosophers and scientists traveled to India where these surgeries were performed by physicians. Removal of cataract by surgery process was also introduced into China from India in later years. The earliest operation for removal of a stone is also mentioned in the Sushruta Samhita. This operation involved exposure and going up through the floor of the bladder. Sushruta Samhita'(Sushruta’s compendium), which describes the ancient tradition of surgery in Indian medicine is considered as one of the most brilliant gems in Indian medical literature. This treatise contains detailed descriptions of teachings and practice of the great ancient surgeon ‘Sushruta‘ which has considerable surgical knowledge of relevance even today. Much of what is known about this inventive surgeon is contained in a series of volumes he authored, which are collectively known as the Sushruta Samhita in which he describes over 300 surgical procedures and 120 surgical instruments and classifies human surgery in 8 categories. 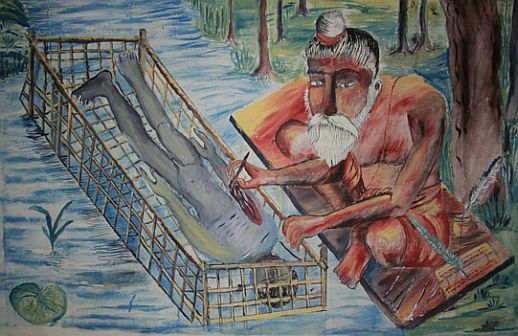 He lived, taught and practiced his art on the banks of the Ganges in the area that corresponds to the present day city of Varanasi in North India. In spite of the absence of anesthesia, complex operations were performed. The practice of surgery has been recorded in India around 800 B.C. This need not come as a surprise because surgery (Shastrakarma) is one ofthe eight branches of Ayurveda the ancient Indian system of medicine. The oldest treatise dealing with surgery is the Shushruta Samahita (Shushruta’s compendium). Shusruta who lived in Kasi (Varanasi) was one of themany Indian medical practitioners who included Atraya and Charaka. He was one of the first to study the human anatomy. In the Shusruta, Samahita he has described in detail the study of anatomy withthe aid of a dead body. Shusruta’s forte was rhinoplasty (Plastic surgery)and ophthalmialogy (ejection of cataracts). 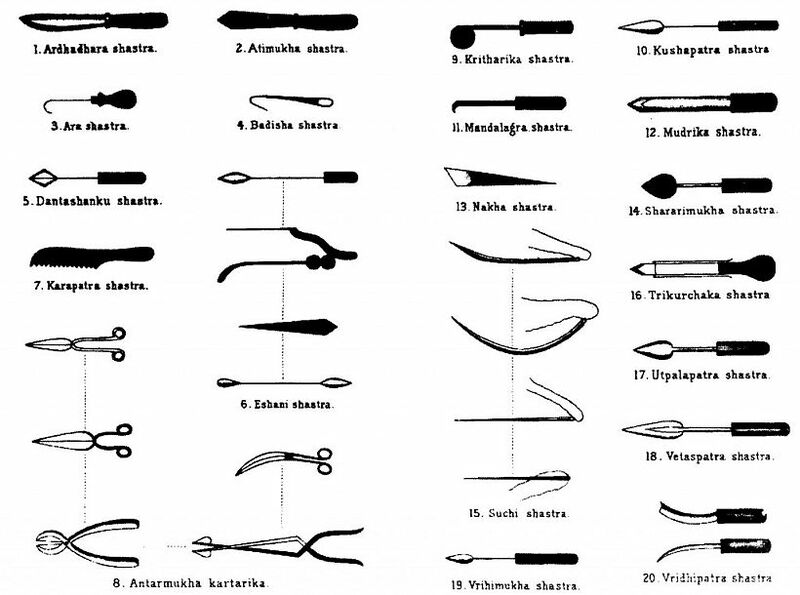 Shushruta has described surgery under eight heads Chedya (excision), Lekhya (scarification),Vedhya (puncturing), Esya (exploration), Ahrya (extraction), Vsraya (evacuation) and Sivya (Suturing). Yoga is a system of exercise for physical and mental nourishment. The origins of yoga are shrouded in antiquity and mystery. Since Vedic times, thousand of years before, the principles and practice of yoga have crystallized. But, it was only around 200 BC that all the fundamentals of yoga were collected by Patanjali in his treatise, named Yogasutra, that is, Yoga-Aphorisms. In short, Patanjali surmised that through the practice of yoga, the energy latent within the human body may be made live and released, which has a salubrious affect on the body and the mind. Now, in modern times, clinical practices have established that several ailments, including hypertension, clinical depression, amnesia, acidity, can be controlled and managed by yogic practices. The application of yoga in physiotherapy is also gaining recognition. Sushruta has pointed out that haemorrhage can be arrested by apposition of the cut edges with stitches, application of styptic decoctions, by cauterisation with chemicals or heat. That the progress of surgery and its development is closely associated with the great wars of the past is well known. The vrana or injury, says Sushruta, involves breakdown of body-components and may have one or more of the following seats for occurrence, viz., skin, flesh, blood-vessels, sinews, bones, joints, internal organs of chest and abdomen and vital structures. Classically vrana, the wound, is the ultimate explosion of the underlying pathological structure. It is, in Sushruta’s words, the sixth stage of a continuous process, which starts with sotha (inflammation). Sushruta says that in the first stage, the ulcer is unclean and hence called a dusta-vrana. By proper management it becomes a clean wound, a suddha-vrana. Then there is an attempt at healing and is called ruhyamana-vrana and when the ulcer is completely healed, it is a rudha-vrana. Sushruta has advocated the use of wine with incense of cannabis for anaesthesia. Although the use of henbane and of Sammohini and Sanjivani are reported at a later period, Sushruta was the pioneer of anaesthesia. To obtain proficiency and acquiring skill and speed in these different types of surgical manipulations, Sushruta had devised various experimental modules for trying each procedure. 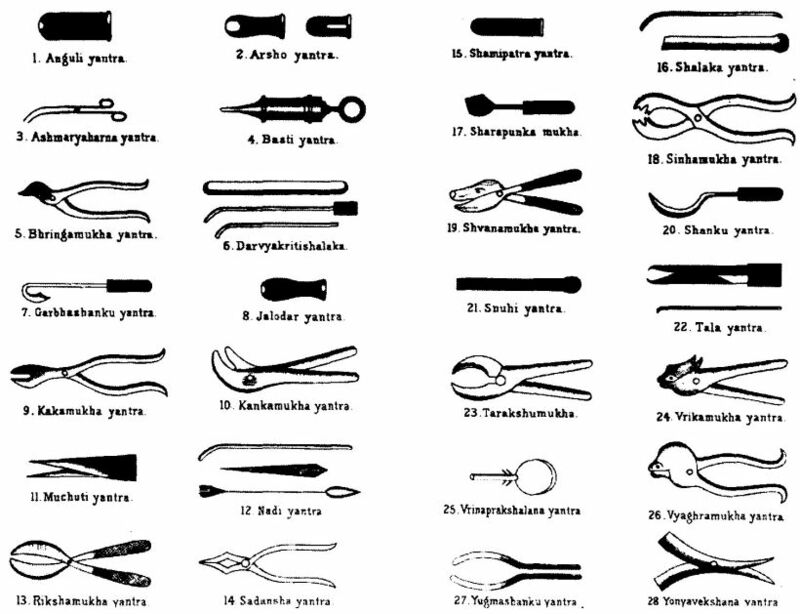 For example, incision and excision are to be practised on vegetables and leather bags filled with mud of different densities; scraping on hairy skin of animals; puncturing on the vein of dead animals and lotus stalks; probing on moth-eaten wood or bamboo; scarification on wooden planks smeared with beeswax, etc. On the subject of trauma, Sushruta speaks of six varieties of accidental injuries encompassing almost all parts of the body. Sushruta also gives classification of the bones and their reaction to injuries. varieties of dislocation of joints (sandhimukta) and fractures of the shaft (kanda-bhagna) are given systematically. He classifies and gives the details of the six types of dislocations and twelve varieties of fractures. He gives the principles of fracture treatment, viz., traction, manipulation, appositions and stabilisation. Sushruta has described the entire orthopaedic surgery, including some measures of rehabilitation, in his work. As war was a major cause of injury, the name Salya-tantra for this branch of medical learning is derived from Salya, the arrow of the enemy, which in fights used to be lodged in the body of the soldiers. He emphasises that removal of foreign bodies is fraught with certain complications if the seat of the Salya be a marma. Sushruta also discusses certain surgical conditions of ano-rectal region, he has given all the methods of management of both haemorrhoids and fistulae. Different types of incision to remove the fistulous tract as langalaka, ardhalangalaka, sarvabhadra, candraadha (curved) and kharjurapatraka (serrated) are described for adoption according to the type of fistula. Sushruta was well aware of the urinary stones, their varieties; the anatomy of urinary bladder along with its relations is well recorded in the chapter on urinary stones. Varieties of stones, their signs and symptoms, the method of extraction and operative complication are given in detail. Apart from the above, surgery of intestinal obstruction (baddha-gudodara), perforated intestines (chidrodara), accidental injuries to abdomen (assaya-bhinna) in which protrusion of omentum occurs are also described along with their management.